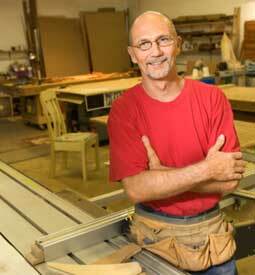 Learn to become a Carpenter — at home, at your own pace, with Penn Foster Career School International. Skilled and experienced Carpenters are in demand around the world, so you can look forward to plenty of opportunity to use your new skills. Hands-on training with professional-quality equipment, so you can learn by doing. Books, lessons, learning aids, special supplements, and equipment included at no additional cost. Earn your Career Diploma in as little as six months, or take longer if you wish. Your complete program includes tools and practical exercises. You'll learn the secrets of framing roofs, exterior and interior walls, floors, windows, doors, installation and much more. We’ll send you FREE information – with absolutely no obligation! Find out more about Penn Foster's Carpenter training.